Yooooo, now this is a banger. I already love Miguel’s song ‘Waves,’ but with the addition of Travy for a remix… fire. EVERYONE is on a wave right now. Last night Kanye had Twitter LIT. He changed the name of his album SWISH to Waves. So dang excited for this one. But anywho, listen to that ‘Waves’ remix below! Remember that time my friend Mac and I attended a free Miguel concert in Venice Beach and took a selfie with him? If you don’t remember, see below. Well, the official Vevo GO Show video is now available on YouTube, and you can spot Mac and I quite a few times throughout. Hashtag blessed I have girlfriends like Mackenzie who are down to do anything at basically anytime! Love ya, girl! 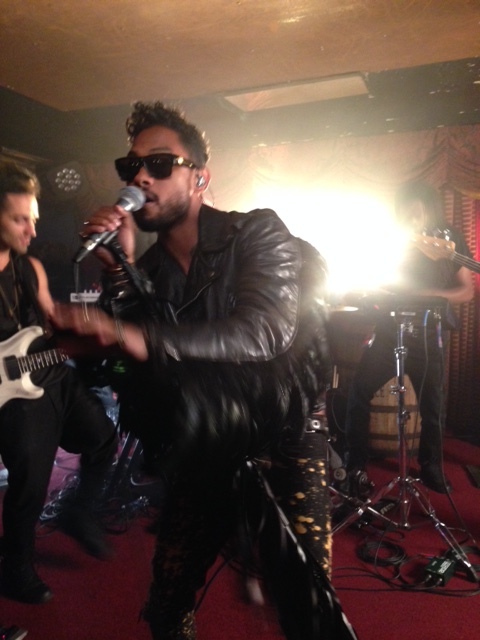 And be sure to listen to Miguel’s new album WILDHEART, out now. Thank you again to Vevo for offering this very unique experience. So what did you do after work last night on Monday, May 18? Probably didn’t go to an impromptu FREE Miguel concert in Venice Beach. I still can’t even believe this was real. Let me explain. …which obviously meant I had to turn on his tweet notifications so I could be alerted the second he released the time and location. Once I realized my roommate Kylie couldn’t come with me since she had #sports (a co-ed soccer game), I text the one person who is down for anything… Mac Bab. Conveniently enough, she was heading to Venice for the night already, so it worked out perfectly. Not knowing if we’d make it in time or if we would even get in, we said YOLO and went for it. Praise to the heavens we did. We were the first people there, so we grabbed a drink at the bar until a very kind man from Vevo told us what to expect and when to head downstairs. We walked RIGHT up to the stage. It was a very tiny stage – we were in the basement of a pretty grungy (but epic) bar. Not knowing what to expect and with a crowd of no more than 50 people, Miguel and his band walked on the stage. Now this is sorta when I went into a state of #celebushock* – might have blacked out a bit (and no mom, not from alcohol). Yes, he was that close. No, this is not zoomed in or filtered. I die. His performance was part of Vevo’s #VevoGOShow – mini concerts/performances, normally a surprise with last minute locations and times that are filmed and posted on the Vevo YouTube channel. I’ll be sure to post the Miguel one once it’s up. But for now, you can check out the videos I took below and visit my YouTube page to see the rest of my footage! After his performance, he told the crowd all drinks were on him in the upstairs part of the bar so everyone should go hang with him, and that is exactly what Mac and I did. We got another picture with him, chatted for a bit, and left around 9:30pm. A solid Monday for sure. And if you aren’t that familiar with Miguel’s music, I highly suggest you check him out. He is so incredibly talented and not to mention so very nice which made me like and respect him even more as an artist and as a person. 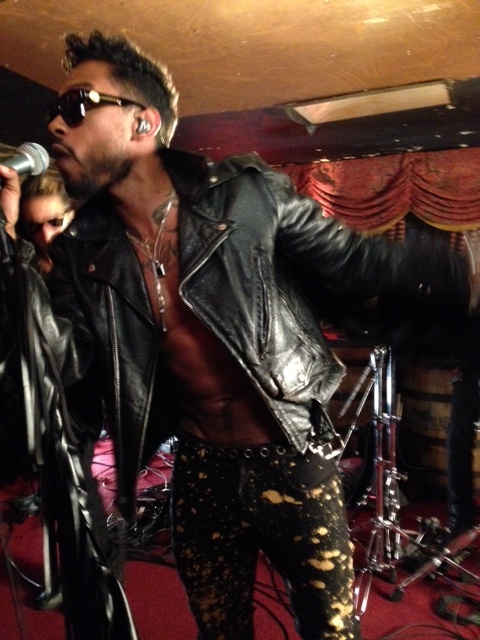 I cannot wait for his new album WILDHEART, dropping on June 30! 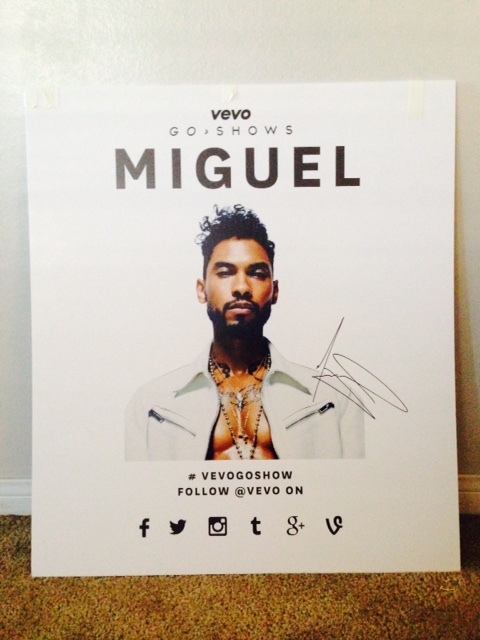 Oh, and thank you #VevoGOShow and my new friend Alex for the autographed Miguel poster. I look forward to more #VevoGOShows and more epic Mondays (or any day of the week really)!